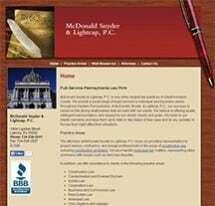 The law firm of McDonald Snyder, P. C. is located in Latrobe, Pennsylvania. We provide a broad range of legal services to individuals and business clients throughout Pennsylvania. Our firm is a general service law firm practicing in the areas of banking and finance law, business and commercial law, condemnation law, construction arbitration, commercial transactions, estate planning, insurance law, municipal law, construction law, litigation and appeals, personal injury law, real estate law and eminent domain law. We represent clients in every level of the Pennsylvania state and federal court systems. The cornerstone of our success is the quality relationship which we maintain with clients. Clients are treated with integrity and respect for their needs, goals, and objectives. We focus on intelligent legal representation and pledge to listen to and communicate with clients. The attorneys in our firm possess high academic credentials, maintain strong community ties, are committed to the pursuit of excellence, communicate effectively, and demonstrate the strictest personal and professional ethics as well as the utmost concern for our clients.